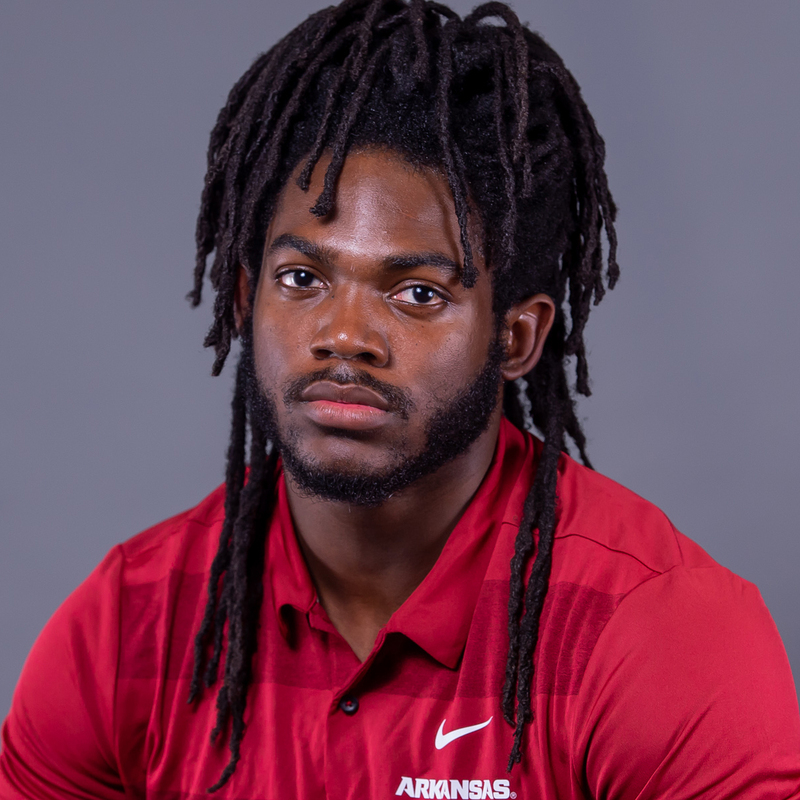 2018 (REDSHIRT FRESHMAN): Played in seven games for the Razorbacks in 2018 … Totaled 52 snaps over the course of his redshirt freshman season, according to Pro Football Focus … Ran the ball 27 times, racking up 144 yards and two touchdowns, averaging 5.3 yards per carry … Opened the season with three carries for 17 yards … Hit a season-high 74 yards on five rushing attempts against North Texas two weeks later, scoring on a 68-yard run near the end of the game … It would also stand as his longest rush of the season … Carried the ball a 2018-high nine times against Tulsa, gaining 23 yards and crossing the goal line on a four-yard run in the third quarter to increase the lead to 20-0 … Posted his best overall offensive grades at Missouri in the season finale with a 72.5, earning a run grade of 69.0 after four carries for 27 yards, as well as a 78.9 in pass blocking … Part of a tailback unit that went for 1,721 rushing yards and 11 TDs. HIGH SCHOOL: Enrolled in January 2017 and participated in spring practice … Rated a four-star prospect and the No. 33 running back in the class of 2017 by ESPN with a scout grade of 80 … ESPN also tabbed him as the No. 57 player in the state of Florida … Ranked the No. 14 running back in Florida by Scout … Graded out as the No. 47 running back in the class in the 247Sports composite ranking … Coached by Binky Waldrop …Finished his career with 38 rushing touchdowns and eight 100-yard games … Named the Suncoast Sports All-Area Player of the Year as a senior in 2016 … Also named to the FACA All-District 18 Class 7A team … Rushed for an area-leading 1,294 yards with 24 touchdowns en route to leading Charlotte High School to their first state semifinal appearance since 2002 … Topped the 100-yard mark on the ground five times with seven multi-touchdown performances … As a junior, he rushed for 664 yards and 12 touchdowns behind Elijah Mack who is currently at South Florida … Also ran track and clocked the fastest times in the state in both the 100m (10.85) and 200m (22.39) events as a freshman … Chose Arkansas over Tennessee, Oregon, Kentucky, North Carolina, Colorado, Illinois, South Florida, Minnesota, Purdue and others. PERSONAL: Born on November 3, 1998 … Son of Michelle Stanford and Cosmo Williams … Has a younger brother, Chad … Undecided on a major.